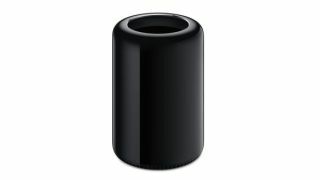 Apple's new cylindrical, high design Mac Pro desktop computer will go on sale this autumn, according to a teaser add for the tower shown in movie theatres in the United States this weekend. MacRumors brings reports from moviegoers who've witnessed the ad for the innovative new Mac, which apparently ends with the line "Fall 2013." During its headline-making launch at WWDC earlier this summer, Apple had previously committed to a "later this year," launch window for its new design it hopes will kickstart the ailing desktop market. The new Mac Pro is a radical departure from Apple's previous tower PCs. It's sleek, curvy, all black body is just 9.9-inches high and a fraction of the size of its predecessor. The various configuration of the Intel Xeon E5 processor will support up to 12 cores, there's AMD FirePro workstation-class GPUs and 1,866MHz DDR3 RAM, which can deliver up to 60GBps of memory bandwidth. The new Mac Pro, which Apple calls "the most radical Mac yet" can also render 4K video, making it a valuable tool for filmmakers shooting and editing at the higher resolution. Despite the size reduction, Apple provides plenty of ports, including 2 Thunderbolt ports, which can each support 6 daisy-chained devices. Following the launch of the movie teaser, it seems likely that Apple will announce a firm release date during its iPhone 5S launch event, expected to take place on September 10 in San Francisco.